Cappadocia is the name given to that triangle of land that lies between Nevsehir, Nigde, and Aksaray. The area is a popular tourist destination in Turkey, as it has many areas with unique geological, historic, and cultural features. Cappadocia is the land of fairy tales, mysterious and enchanting. Just some of the incredible sights waiting to be discovered here are the fairy chimneys, underground cities, hot air balloon tours on this incredible landscape. Cappadocia is a legendary place in the world with its mysterious underground cities which are unique to this region. There are almost 150-200 underground cities just 36 of them have been discovered. Here are the 6 mysterious subterranean cities dating back to 3000 BC. Ihlara Valley is the most famous valley in Turkey for hiking excursions with its nature and cave churches. The valley is a 16 km long gorge cut into the volcanic rock very close to Guzelyurt Village, holds about 60 Byzantine churches, chapels and monasteries. Goreme National Park and the Rock Sites of Cappadocia is one of the most mysterious and extraordinary natural landscapes in the world. This site contains superlative phenomena or areas of exceptional natural beauty and aesthetic importance. 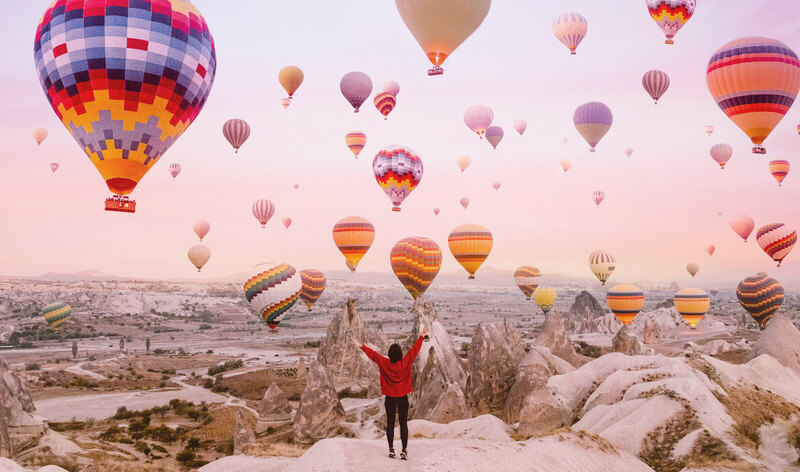 Cappadocia is one of Turkey's most iconic destinations and the most popular places in the world for its dreamy landscape, rock formations and hot air balloons. Here is the list of 20 good reasons to travel to Cappadocia before you die. Spend a night in an elegantly renovated cave house, explore the ancient underground cities where thousands of people lived, take a sunrise balloon ride over the fairy chimneys. Prepare to be enchanted by the marvelous blend of cultural history and natural wonder. Cappadocia is the world's most famous rock star, come to be happy. Cappadocia is one of the best hiking areas in the world as it has a dramatic geography and a rich cultural heritage distilled over the ages through many diverse cultures living side by side. Cappadocia is like a blissful gallery of colourful balloons. Hot air ballooning is very popular in Cappadocia and is available in Goreme. We want to remind you the most attractive festivals and dates of Cappadocia. These festivals aim to promote the unique geography of region and catch the fascination of millions across the world. Cappadocia is one of the most picturesque regions of Turkey. Check out the incredible Fairy Chimneys of Cappadocia from up close, from away, from up high and down low in this amazing video on the wonder of this magical land.